The classic has become a legend. 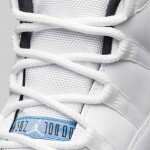 Released back in 1996, the Air Jordan XI is widely regarded as one of the best Air Jordans ever. 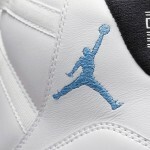 This original colorway is a mix of patent leather and smooth leather in all white, with a tongue tag, Jumpman logo and translucent outsole tinted in Legend Blue. If you’re interested in picking up a pair this Saturday, please read our release details below. 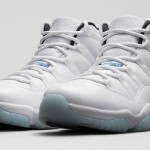 In partnership with mall management, Foot Locker and House of Hoops by Foot Locker stores will implement a ticket procedure* in order to purchase the Air Jordan 11 Retro “Legend Blue” (on-sale 12/20 for $ 200) First come first serve ticket procedure stores will begin handing out tickets at 9:00 a.m. local time (or otherwise noted) on Sunday, December 14th. Sweepstakes stores will hand out tickets on Monday, December 15th and Tuesday, December 16th. For addition details and to find out which stores near you will carry the shoes and which ticket procedure they will implement, please visit the Launch Locator. Kids Grade School ($ 150) Pre-School ($ 85) and Toddler ($ 65) sizes will also be available. 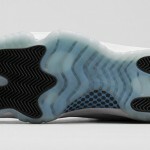 The shoe will be available starting at 8:00 a.m. EST on Saturday, December 20th on Footlocker.com. 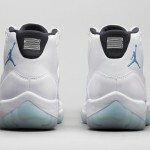 The full family of kids sizes will also be available. 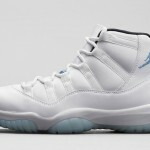 Print article This entry was posted by hhcblog on December 14, 2014 at 12:44 pm, and is filed under Footwear. Follow any responses to this post through RSS 2.0. You can leave a response or trackback from your own site.